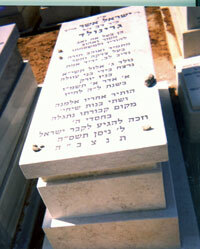 Israel Greenwald's Grave in Israel: His body hidden for 19 years, he was finally properly buried in May 2005. The Stone says:"Israel Asher Greenwald, Son, Husband, Brother and Father precious and loved by his parents and family. Learned and Loved the Torah, a charitable and kind man, big hearted and a good friend, born on Sept 4, 1951. Killed by the hands of evil people in New York on Feb. 10. 1986 when he was only 34. He left behind a widow and two daughters. His body was discovered by the grace of God and was privileged to be buried in the land of Israel in May 2005. May he rest in peace."